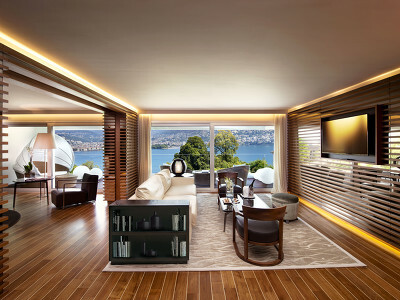 Each of the 16 Junior Suites and 2 Suites has their own terrace and face Lake Lugano. All have been decorated and designed with 5 star luxury in mind; teak floors, scented pillows, a choice of fine satin bedlinen, chromoshowers, choice of bathroom products and a bespoke service that one would expect on board a luxury yacht - including a fully stocked minibar. Each of the 11 junior suites is individually decorated by interior designers to give the sense of being on one's own private yacht. All have private terraces with lake views, kingsize bed, and personalized amenities in the bedroom and bathroom. Each of the two suites features stunning lake views and distinct interior design to give the impression of a being on one's own private yacht. The suites comprise a bedroom with kingsize bed, en-suite bathroom and living area. There is a choice of boutique amenities in the bedroom and bathroom. A 2 night stay (Friday- Sunday) including 10% off the usual rate, 30% off spa treatments and a continental breakfast. A 2 night stay (Saturday- Monday) including 20% off the usual rate, 30% off spa treatments and a continental breakfast. A 3 night stay (Friday-Monday) including 25% off the usual rate, 30% off spa treatments and a continental breakfast. These offers can only be booked within 59 days of arrival. THE VIEW Lugano sits quietly and majestically on the hill of Paradiso overlooking the city and the Lake of Lugano. Not only has it introduced a brand new boutique hotel concept to the city of Lugano, but also to Europe: to enjoy the feeling of being on a luxury yacht in the middle of a city. Surrounded by naval teak, used on the best luxury yachts, guests can admire the views whilst enjoying the sensation of being on a luxury cruise ship. A complete sensory experience has been put together by architect Luca Gazzaniga and interior design team Interior Haut Design. This boutique hotel in Lugano is a design first and the contemporary suites, spa, and restaurant combine together to make THE VIEW Lugano the best luxury hotel in the city. The Saunas, Hammams, Jacuzzis, and Kneipp path allow guests to truly relax and every treatment is personally designed to fit each individual's needs, creating a deeply personal and unique spa experience. The pool is 18m long, and with its stunning lake and mountain views, it is the ideal place to relax and unwind or to swim off the stresses of the day. The gym is fully equipped with the latest Technogym equipment. Lugano is a world-class city and the largest in the Ticino region. There are plenty of things to do and see including lake trips, shopping tours, mountain walks and lunch in one of the Grottos. Eros Picco and Tommaso Arrigoni’s on-site restaurant ‘Innocenti Evasioni’ is born from their passion & creativity, and their recipe for success lies in the flavours and originality of their dishes. The ingredients used are always fresh and local wherever possible; they are put together with flair to create a selection of Italian and international dishes complemented by an eclectic wine list. Lugano is also a centre of fine dining; we recommend Al Portone (Viale Cassarate 3) for the finest Italo-Swiss dishes. Those up for a drive might consider Il Verderamo (Vicolo del Frate 3A) in Castello Cabiaglio, just under an hour away, for exceptional, unpretentious northern Italian cooking. The nearest train station to the hotel is Lugano, a ten-minute drive away (Approximately 3km distance). Transfers are available from the station. The View Lugano can be reached via the A2 AutoRoute - exit at Lugano Sud and head for Paradiso. The nearest airport to the hotel is Lugano Airport a 15 minute drive by car (Approximately 6.5km distance). If cancellation notice is received more than 48 hours prior to expected arrival date, cancellation is free of charge. If cancellation notice is received less than 48 hours prior to expected arrival date guest is responsible for 100% of payment of first night. The same policy is applied to no-shows. Early check in & Late check out are subject to extra charge and availability. We stayed in this hotel 3 nights. The hotel is very beautiful,well located, the views are just awesome. We were delighted with the design of the junior suite. The staff was very nice. Also positive points are the electric cars and the bikes which are lent. Points, which we consider has to be improved are: Breakfast inlcuded in price is just too lacking, everyday the same and unacceptable is the hard bread in an hotel with 5 stars. Noway. Dampfbad and Sauna are small and the thermal pool is cold. I also think convinient to focus in some little details in the room, like some scratches on the caffeemachine or the water from the shower bursting to the floor. But generally speaking is a very beautiful hotel with unique views. Excellent costumer service. Beautiful place with a view on the lake. Simply outstanding. Service is excellent with staff that exceeds and outperforms what you will find at Four Seasons, Peninsula and Mandarin Oriental properties. Every request is completed immediately. I have stayed here two times and will be returning regularly. The breakfast is of the highest quality and appropriately portioned. The spa and gym have the latest equipment and staff that are trained well. The rooms are modern and well appointed with terraces/balconies that are comfortable to take in a spectacular view of the lake and downtown Lugano. Lugano is a far more elegant destination than Como/Bellagio with superior dining and shopping and one of the most elegant lakeside promenades in Europe. Only 1 hr from Milan Stazione Centrale. Even Lugano's train station is exceptional. Great location. Attention to details and beautiful spa / pool. This is your destination in Lugano!